PELOPONNESOS. ACHAIAN LEAGUE. Megara. 175-168 B.C. AR hemidrachm. 2.24 gm. 17 mm. Laureate head of Zeus right / Achaian League monogram, kithara (lyre) above, H left, PO right, all within laurel wreath. BCD Peloponnese 27.3. 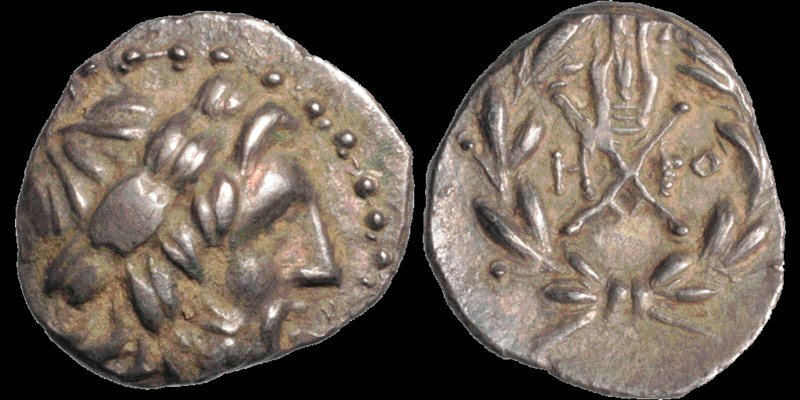 Agrinion 451 (these dies). Good Very Fine; high relief strike. Fresh surfaces under attractive lustrous multihued toning. Ex Leu, Jan. 1979 (tag, 1822). Ex BCD with tags and photos.